New York City is bursting at the seams with people, energy, and opportunity. Unfortunately, a crowded urban city also means your skin is constantly being bombarded with pollutants, toxins, and congestion. This environmental stress makes maintaining good nutrition especially important, as it helps your body hold on to essential compounds for longer. What’s one mineral that you should definitely be keeping tabs on? Silica. Silica is everywhere around you, and it is an essential compound for keeping your hair, skin, bones, and connective tissue strong and healthy. Even so, many people are deficient in silica– especially if they live in clogged urban climates like New York City. If you’ve noticed that your hair and nails have been breaking more easily than normal, it may be worth your while to start incorporating more silica into your diet. Load up on shiny vegetables to help stimulate collagen production, detoxify your cells, strengthen your immune system, and help your body recover inside and out. You can learn more about silica deficiency and how to remedy it naturally by listening to Kimberly Snyder’s podcast. Listening in to this episode on silica is what made Carmel want to go out and buy some horsetail to incorporate into her own diet! 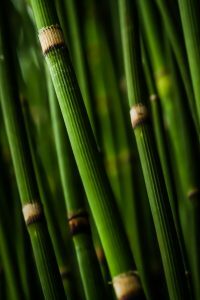 Horsetail is great for tea, soups, stews, and stir fry dishes. Why not give it a try, and get back your silica in the city?